Well, we have always said that our vision is in ink but our plans are in pencil. The vision is ink because no matter what happens and no matter what situation we are in we will always come to share the love of Christ and to share the gospel to all we have the opportunity to. That will never change, but the plans we make are written in pencil because we know that no matter how much planning we do and preparation we give ourselves those plans will often times change. Which is what is happening today and seems to happen more often than not and in some years it seems as if it is non stop. This is one of those years. We have had problem after problem when it comes to the construction projects to lost luggage, to dropped emails, and now to delayed team members. How to put today into words? Today was such a beautiful day, an overwhelming day. Our hearts are overwhelmed with gratitude for what God has been doing through our visits to the Orphanage and the Camp - it is just absolutely incredible. We went to the Orphanage today and taught them baseball. 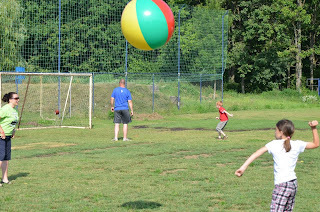 We also took footballs and kicked field goals, and took some beach balls to play with. Rachel, Bethany & Maneula took some of the girls and taught them Line Dances. It was just absolutely incredible to see the joy in some of these kids hearts. It was wonderful. We just pray that we planted some seeds by using our steps to plant Christ's footsteps in their hearts and their lives. We handed out some Our Steps, His Print bracelets, and they just kept asking for more! We also handed out some gospel tracks, different cartoon gospel tracks to the kids. We have about ten different kinds, and took one of each. They would read them and then pass them on. It was absolutely incredible! I am going to write this morning and give my voice a break. After camp yesterday my voice is a little on the weak side. The allergies are hitting me pretty hard again this year and the combination will make it to difficult to spit the words out. If you would proof I would be grateful. Love to express myself through word but it takes me so long and not always sure I get my point across! Thanks so much for your wonderful help and dedication to helping us serve HIM! Hope all is well back in Houston. Things are fast and furious here! Great things are beginning to happen and slowly but surely we are getting things accomplished. The camp is going great and today we head back to the orphanage to do a baseball camp for them and play other games with them. Thanks for the prayers. As I approached planning for my Croatia trip, I gave myself several objectives. I accomplished one of these objectives today. I reached out to one of the Catholic charities in Sisak. My Aunt Ruth (from Pearland) is a Catholic who contributed to our mission trip this year and wanted to do more for the Catholic churches in Sisak. I met with Father Branko today (sp?) and explained how several Catholic families in Houston and Pearland wanted to contribute to God's work in Sisak. My aunt's group wants to do more in the future to help the youth, unemployed and needy in Sisak by contributing to specific causes as suggested by Sisak's Catholic churches. This will be a new effort for us, but I am faithful & hopeful that this new source of funds can assist with God's outreach. I believe that new opportunities will come from this effort, and I will let you all know how this turns out. Stay tuned! Today was an amazing day. We went to the SOS Village to have a Texas Carnival. We had five games set up with all of us girls, David, and 2 of the Storks to run the Carnival. When the kids started coming over and playing the games, they had smiles from ear to ear! I could see kids in the distance running to the field to see what was going on. About 50 kids came to play the games, and they stayed around for the whole time - playing the same five games over and over! They seemed as happy on the fifth time as they were on the first. For me personally, I had to keep choking back tears as I thought about how God has answered my prayers regarding the SOS Village. Last year at this time we were not able to do what we did today. Now we were able to glorify Him by playing games at this orphanage. I don't have enough words to describe the blessings of today! The joy would overwhelm me if it were even possible to fully express my joy! Today was absolutely incredible. Out the seven years we have been here, this has got to be in the top 10 days! So many things that went on today that were used to glorify Him were incredible. The day started a little rough when we realized that the stage hole was a little too deep, and I had to run to 4 different places to get rebar, wood and other supplies. Dalton, Chris & Rusty had to re-dig to straighten the site - it was a bit off. Robert & Elvis were a great help this morning. Here are some pictures to help those of us on this side of the 'pond' to see what is happening in Croatia! First Day of Camp. 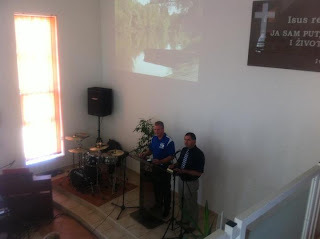 Today was the first day of Mission Croatia 2012 and we hit the ground running. It was great to get out early and put in some good ol fashion manual labor. The air was crisp and clear and made for easy working, if you call pushing dirt around easy. But as it says in Corinthians, "in all you do, work as if you are working for the Lord." Dalton, Robert, Rusty and myself worked to dig out and form the area for the stage that needed to be cemented so the "Rock" can do his thing when he gets here. To be honest, from all indications I had a thought that we would have 5 or 6 kids show up for camp today. Tuesday notes from David.... again, please forgive any spelling errors on the Croatian names! Several of the Storks went with us to the airport (Elvis, Armon, Jeffa & Manuella) - I took Janko's car. It was neat to see them all greet the group that came in. We now have 7 more (six on the first flight, and Katie came in 2 hours later.) Stefan and I stayed for Katie's flight, using that time to go through the video and talk about plans. What an incredible day! God answered so many prayers. To see the response from the team was absolutely incredible. When I first came to the field this year and walked around, I was struck by how well the Storks have been taking care of the inside of the field. They use the lawnmower that we bought last year to keep it up. There are no weeds in any of the bases or around the pitchers mound, and everything is taken care of. But, the weeds along the fence outside of the field and behind home plate & around the batting cages are absolutely horrible. I know they just don't have the means to take care of it, and the city doesn't give them any help to do so. You see it everywhere - even downtown between the medians and around the river... they just don't maintain like we do in public areas. This is transcribed audio from David... please forgive the spelling of names! It is neat to see some new young ball players with the Storks. Cascas, Armon and Junior being the new additions. We had a good time at practice on Friday - we hit in the cage and did some infield/outfield work. He also said that Elvis was elected as one of the Assistant Coaches for the National Tournament! That is a huge privilege and honor. Everyone is very excited about this position for Elvis. Please pray for safe travel for the group leaving Monday for Croatia. Pray that all their luggage arrives with them, as they all have extra bags of equipment, etc. that will be used in the camps, carnivals and at the library. 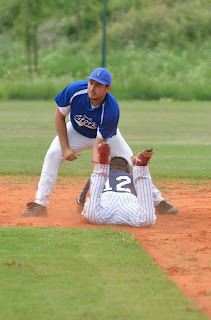 Croatia Mission 2012 - June 21. We're heading to Croatia for our 7th trip. We go to "Love 'em where they are, and love 'em 'till they ask why!" This is year #7, and through the years we have plowed a lot of soil, removed a lot of rocks, and planted a lot of seeds. We've watered a lot of those seeds, and we've even seen a few fruits of that labor being harvested. Our prayer this year is that through all of the dedication of serving Him and reflecting His love, we will see a bountiful harvest where the baskets are filled to capacity and lives will be changed by open and responsive minds and receptive hearts. We feel God is busy preparing new rooms for many in His heavenly mansion. Please pray along with us that our hearts, action and words will continue to reflect Christ as more will begin to ask "Why." God has grown this ministry in so many ways, and has opened so many doors to share him. I spoke with David late last night and again today. Big praise! They got confimation the shipment left New York and is scheduled to be in Croatia July 1st. Continue to pray that it clears customs quickly. That could take up to ten days, so please pray it clears quick as it contains so many things need. 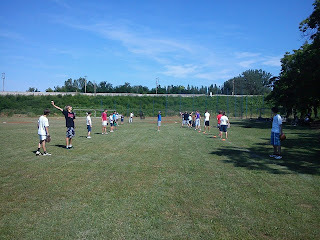 Yesterday they had baseball practice with the Storks. After practice they measured the hole for the foundation of the stage they plan to build for Fields of Faith. They have it all marked off and hope to hire a backhoe to come dig it out so they don't have to do it themselves. Pray that there is a backhoe available so they don't have to do it by hand. The hole needs to be roughly 24ft. x 13ft. so a backhoe would be a huge praise! David talked with Neven at practice and he said he hadn't been reading the bible very much but wanted to learn how to study it better so they are going to discuss later how to do that. David just called... very brief since it was pretty late there and he was going to bed. He will call me back when he wakes up, just wanted me to know they got there safely. They had practice today with the Storks. The field "The Nest" is in fairly descent shape, but the city is not doing anything to help them out. There are lots of big weeds all around the outside of the field, which was not good. Pray they can get that cleaned up soon. 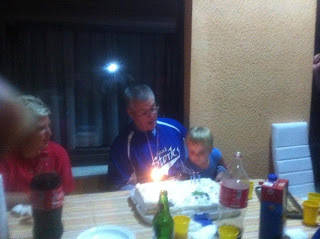 Tomorrow the Storks play a game in Karlovic and afterwards they want to celebrate David's birthday. Hope to send more detailed update when he calls back. June 22, 2012 - The First Group is in Croatia! I just got a short email from David. God is good! David, Shannon and Marde landed safely with no problems. There was a great crowd at the airport to greet them when they arrived. They were headed to Janko's house to get some rest then of to The Nest for baseball practice. He will call me later this evening with more details. Mission Team, I got up this morning and started my day with this devotional and wanted to share it with you all! I share this to encourage you and to thank you for your dedication to serving Christ is Croatia! Your willingness touches me to the core of my heart and to know that God has placed this team on this path together is such a blessing to me! He wants to use us in mighty ways, with us depending on His strength and His provision! Notice the words that were used in the last couple of sentences of the devotion! (I made them bold) Seems only fitting that I share it with you all! It is indeed our vision that is WRITTEN IN INK, Our steps leaving HIS PRINT!